Disseminating information regarding environmental education is one of the 5 constitutional objectives of EEASA. Publications play a key role in achieving this objective. Journal: The Southern African Journal of Environmental Education (SAJEE) is a forum for the publication of research papers, book reviews, comments and critiques of an academic nature. SAJEE goes digital. Please see below. Bulletin: The Environmental Education Bulletin includes information articles, news snippets, regular updates, letters, reviews of new resources and creative contributions. Members are encouraged to contribute to the Bulletin in a language of their choice. Monograph: The EEASA Monographs are occasional publications that deal with specific topics. To date four monographs have been produced, on Evaluation in Environmental Education; Projects in Water Quality Monitoring; Indigenous Knowledge; Environmental Education, Ethics and Action, and Learning in a changing World. The Southern African Journal of Environmental Education (SAJEE) is an internationally refereed journal published once a year. The journal is published by the Environmental Education Association of Southern Africa (EEASA). The SAJEE aims to publish and report on a wide range of aspects relating to Environmental Education, Ethics and Action in southern Africa and elsewhere. The journal seeks to further the study and practice of environmental education by providing a forum for researchers, scholars, practitioners and policy makers. 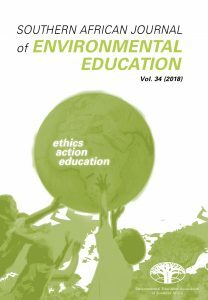 The journal aims to carry papers reflecting the diversity of environmental education practice in southern Africa, and includes conference reviews and keynote papers, retrospective analyses of activities or trends in a particular field, commentaries on policy issues, comparative aspects of an environmental education, environmental ethics or environmental action issue, and critical reviews of environmental education, ethics and action in a particular country or context. To see current volume and archives visit the African Journals Online (AJOL) website. To see the Editorial Policy and Guidelines click here. Volume 34 of the Southern African Journal of Environmental Education (SAJEE) has been published! EEASA thanks the contributing authors, the reviewers, and the producers of this Journal, the Environmental Learning Research Centre (ELRC) at Rhodes University, the Managing Editor of Volume 34, Dr Lausanne Olvitt and the other members of the editorial team: Journal Manager Carlene Royle, Deputy Editor Dr Muchaiteyi Togo (University of South Africa), and Editor-in-Chief Prof Eureta Rosenberg. A special vote of thanks goes to Prof Heila Lotz-Sisitka from South Africa and Prof Jeppe Laessoe from Denmark for leading the very interesting set of Think Pieces in this edition, and contributing to the Editorial. Feel free to download SAJEE abstracts and full papers from the Open Access Online platform hosting SAJEE, African Journals Online, at https://www.ajol.info/index.php/sajee. In October this year, at the EEASA 2018 Conference in Livingstone, Zambia, members of the editorial team will host a workshop on becoming a SAJEE author. For details on how to register for the conference, please visit the EEASA website, www.eeasa.org.za. Scholars wishing to submit a paper for publication in the Southern African Journal of Environmental Education (SAJEE) can now do so with a few clicks. The open-access journal of EEASA, the Environmental Education Association of Southern Africa, has moved to an online submissions and review portal. While the SAJEE itself has been accessible digitally via African Journals Online (AJOL) since 2016, the submissions and review process went online in March 2018. Editor-in-Chief, Professor Eureta Rosenberg, who is the Chair of Environment and Sustainability Education at Rhodes University, hopes that the greater access afforded by the open access digital publication will encourage more researchers in the region and internationally to the SAJEE. Readers can look forward to the forthcoming special issue of the journal, hosted by Guest Editors Prof Soul Shava from UNISA, and Prof Rosa Guadalupe Mendoza-Zuany, from Universidad Veracruzana. They chose the theme of Social-ecological landscapes, Indigenous peoples’ livelihood practices and education for future sustainability: Cases of co-engaged learning and South-South exchange (bridges) as part of a transgressive effort to bring out voices from the so-called “Global South”. The special issue will speak to situated intergenerational knowledge and livelihood practices derived by indigenous communities that commonly find themselves marginalised and confronted by narrowing prospects of future sustainability. Authors were invited to focus on co-engaged environmental learning processes. The SAJEE has come a long way since its first volume published from Rhodes University Education Department in 1984, speaking for and to wide audiences on the African continent and beyond. In March, 2017, the journal saw more than 1 250 article downloads globally, with the number of downloads averaging above 500 even in quieter months. “What makes this evidence of access across the globe and in the Southern Africa region so great, is that the SAJEE is the only journal of its kind serving the region, and one of few environmental education journals serving the South overall,” says Professor Rosenberg. “Online submission and distribution means that the journal is now even better able to serve the region, and we are very grateful to AJOL and to Sida for the funding that made this possible,” she adds. While the SAJEE may now be fully embedded in the digital realm, the quality remains as high as ever. A South African government-accredited journal, the editorial teams adhere to strict policies to safeguard the quality and rigour of the scholarly works published. For those considering contributing, the SAJEE welcomes submissions with a focus on Environmental Education and/or Education for Sustainable Development. Though primarily an Education journal, submissions from the fields of Communication, Environmental Sciences, Development Studies, Labour Studies and others are also given space where the core focus is on education, communication, learning and/or public awareness. The online submissions process and author guidelines can be found on AJOL.